VCM focuses on understanding customer requirements, including manufacturing and maintenance processes, and also assembly components, like industrial line parts and accessories, solutions that will be highlighted in the company booth in Intermach. In order to provide customized solutions in Engineering, Boilermaking and Maintenance, the activities will be performed by a qualified professional team, and certified raw material, structural calculation engineering software and 3D project development software are used. VCM customized solution benefits can be expanded to a sustainable manufacturing, by means of equipment change proposal aiming at benefiting the environment, optimizing the asset use. Concerning equipment and professional safety involved in the processes, the company applies the standards in force and follows NR normative. The solutions released recently rely on industrial parts and accessory in tooling, electrics, measurement and test, machine, insert, machining, thermoplastic, thermosetting and fastening element fields, among others. The full line has already been applied to food, chemical, petrochemical, car maker, casting, paper and pulp, timber and office furniture industries, standing out for quality good service in shortest time possible. 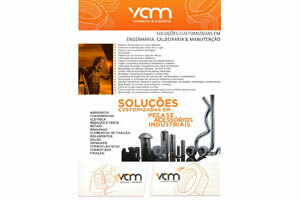 Located in Curitiba, PR, VCM has a wide reach in the Brazilian and overseas markets. It operates in customized solution trading in engineering, boiler making and maintenance, and it provides industrial parts and accessories. It manufactures equipment to service different requirements of food, chemical, petrochemical, car maker, casting, paper and pulp, timber industries, among others. Moreover, its supplies stationary and rotary equipment maintenance services, with the possibility of keeping routine maintenance teams in mechanic, welding, instrumentation, electric, boilermaking and inspection areas.